The clutch fluid level in the master cylinder should be checked when performing other under hood services. The system should be checked for leakage at the same time. Check to make certain that the clutch fluid level is always between the "MAX" and "MIN" level markings on the fluid reservoir. Fill as required. 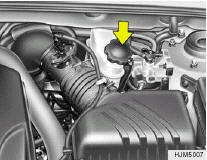 Fluid loss indicates a leak in the clutch system which should be inspected and repaired immediately. Recommended brake fluid conforming to DOT 3 or DOT 4 specification should be used. The reservoir cap must be fully tightened to avoid contamination from foreign matter or moisture. Do not allow any other liquids to contaminate the brake fluid. Seal damage will result. Use caution when handling brake fluid. It can damage your vision if you get it in your eyes. It will also damage your vehicle's paint if spilled on it and not removed immediately.